Blog Semi-Retired. More Musings on FilmiGoris.net! Hey there! Thanks for dropping by Ascertainment Weekly! Take a look around and grab the RSS feed to stay updated. See you around! I can’t belive my bad luck! The first time, at least in my awareness of his work, that Sukhwinder Singh is in town with his own musical tour, and I’m scheduled to work! You may not know it, but this is an actual verifiable tragedy. Sukhwinder Singh is one of the most popular playback singers in current Hindi music, but more importantly, his voice hits me in a very elemental place which can often, though I have no idea what he is actually singing about (love, I’m assuming…given my involuntary heart palpitations) reduce me to an emotional state of romantic sticky-sweetness roughly the consistency of gulab jamun. Every time. Darn him. You’d never know to look at him. Nice face, pleasant, even, but they don’t pay him to look good…they pay him to SING! And boy, does he deliver. In films, his voice often dubs in the singing voices for the most popular film heroes, sending all of their female fans over the edge of the Prem Kahani Abyss (Love Story Canyon, so to speak). How can a man who seems so wardrobe-challenged (no, I mean it, google his pictures… he’s gone through so many different looks on his search to look current and trendy that he may have lost his way completely…), how can he hold me (a costumer, no less) in complete thrall, just hearing a half dozen notes from his golden voice. Similar in effect to the rough-hewn tones of Nicholas Reyes, of Gipsy Kings fame, but perhaps more modulated, Sukhwinder sings as if he’s channeling the voice of Nature itself. Listen… Don’t ask me what’s going on the video, I have no idea who most of them are. 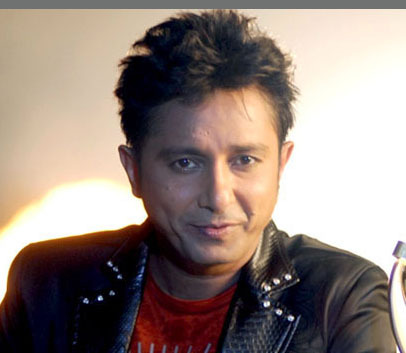 Though Sukhwinder can write and produce his own wonderful works, like Ghar Aja, above, some of my favorites are his collaborations, most notably with A.R. Rahman in Slumdog, Taal, Meenaxi and Lagaan but also with Vishal Bhardwaj whose film Omkara really showcases Sukhwinder’s voice. Here’s the most popular hit from it, the Beedi song. Actors: Bipasha Basu, Saif Ali Khan and Vivek Oberoi. I’d list more links, but we’ll get Youtubed out. If you’d like more, check out the following links, just add the http://www. thing in front. And if you’re interested, go see his show at DAR Constution Hall on Saturday, May 8th…if I can’t be there maybe some of you can go for me. I’ll probably be the gulab jamun hanging out at the stage door with her ear stuck to it (Eh…actually, gulab jamun’s shouldn’t even have ears…What a visual…), if I can swing by after my show gets out. Darn that paycheck…don’t suppose I could call in sick?..No, Susie, I won’t. 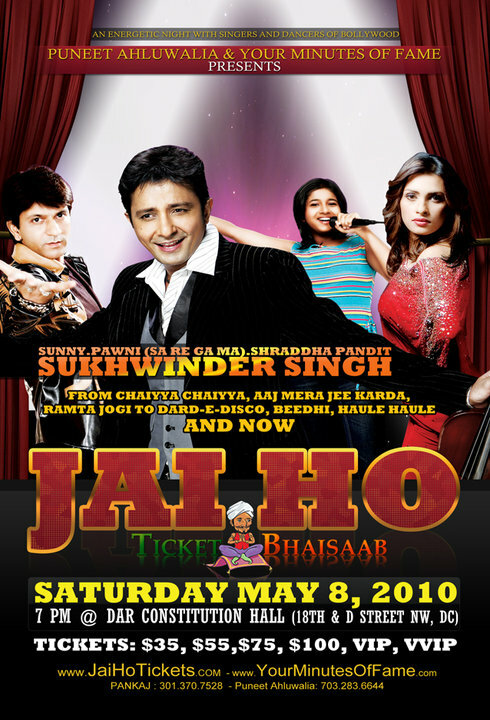 Tickets at, of course, http://www.JaiHoTickets.com. UPDATE: I’m devastated…I bit the bullet, I bought a ticket to the event, even though I knew that I could only attend half the event. I went to work, alarmingly overdressed for theater work, yet still primarily in black. I looked great…or as great as they will ever see me at work (it takes a lot out of me, at this age, let me tell you!). I rush over to DAR, find a parking place alongside…now, that begins to worry me. No noise, no parking problems…all is not as it should be. I walk to the front entrance, dark as a tomb. I wandered around to the stage door and ring the buzzer. “That show was canceled this morning, ma’am.” What? When did that happen? I only bought my ticket three days before! Sigh…so close, and yet, so far from my musical idol… I am needless to say, a bit perturbed. Online it looks as if the concert has been rescheduled, but no news is posted except the date, June 5th. Same venue. We’ll see if it all rings true. Gulab jamun, signing off for now. Have you checked out “kaawaan kaavaan,” from “Monsoon Wedding.” A wonderful movie and one of Sukhwinder’s best song. Interestingly, “Jai Ho” is neither the best of Sukhwinder or Rehmaan. As you may already be knowing, both have done far better work earlier. But But it was Jai Ho with got them awards and recognition in western world, because it happened to be part of a British production. Sometimes I wonder if Oscars, really appreciate international cinema (only one award) and Grammys, international music.